Winter offers the perfect time to curl up under a blanket and enjoy some well-earned downtime watching your favourite films and TV shows. However, winter is also the peak season for stressed bodies to pick up germs and illnesses. While the season of spring has been often lauded as the best time for a mighty clean up, in modern times we’re seeing a larger need for families to ramp-up their cleaning practices right on the verge of cooler months. Hygiene should always be front and centre, but wintertime offers some unique challenges that are best tackled with preventative measures. Most experts agree that colds and the old flu are frequent during chillier months because people are drawn into closer quarters indoors. When combined with recycled air systems, germs communicable through droplets – like coughs – may be carried broadly within rooms and even buildings to encourage the spread of illness. Improving the hygiene within your home can reduce the risk of germs spreading within your family and remaining to cause reinfections. Issues caused by poor ventilation, such as mould and rot, tend to peak during winter months when rooms are likely to be sealed off against the elements. Mould and rot not only play havoc on those with respiratory difficulties, like asthma but can lead to long-term structural damage. 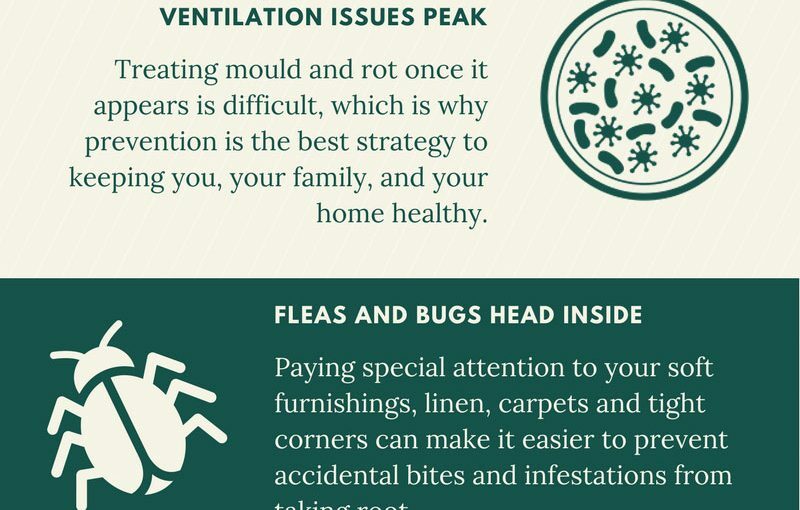 Treating mould and rot once it appears is difficult, which is why prevention is the best strategy to keeping you, your family, and your home healthy. Insects love to hide in the dry warmth of your home, so homeowners have to be on the watch. From spiders and millipedes to bed bugs and fleas, the artificial warmth of your home can make it difficult, if not dangerous, to share your home with strange bedfellows. Paying special attention to your soft furnishings, linen, carpets and tight corners can make it easier to prevent accidental bites and infestations from taking root. Muddy boots and pants can leave a trail of destruction on your carpets if not treated quickly. Mud can ingrain itself deeply into your carpet pile, making it extremely difficult for extraction at a later date. To prevent long-term damage, make sure to add regular carpet cleaning to the cleaning regime. Winter is not just a time for creature comforts, it’s the perfect time to host intimate dinner parties with your friends and family. If you’re looking to invite your nearest and dearest to your home, make sure to have a spick and span home to make entertaining fun and clean-up simple. Keeping your home clean and germ-free this winter doesn’t have to be difficult; for more information on how we can make your home fresh all year round, please contact our friendly team of house cleaners today!